For decades, rocket scientist Robert Zubrin has been a voice crying in the Martian wilderness. But now the president of the Mars Society is pleading the case for a cause that’s much closer than the Red Planet: low-cost lunar exploration and settlement. Zubrin’s lays out his latest plan, known as “Moon Direct,” this week in a tech journal called The New Atlantis, and he’s in Seattle today to talk about it in conjunction with the Museum of Flight’s SpaceExpo 2018. The expo also features demonstrations of a virtual reality project highlighting one of Zubrin’s longest-running projects, the Mars Desert Research Station, a testing ground for space settlement that was built in Utah back in 2001. If Zubrin gets his way, such outposts could be built on the moon and on Mars as well, on time scales far sooner and at costs far lower than NASA projects. The problem is, Zubrin doesn’t always get his way. Since the 1990s, he’s advocated for a mission architecture known as Mars Direct that would first send uncrewed rockets to Mars and follow up with later crewed missions. Each mission would make use of on-site materials to produce the fuel for the return trips. 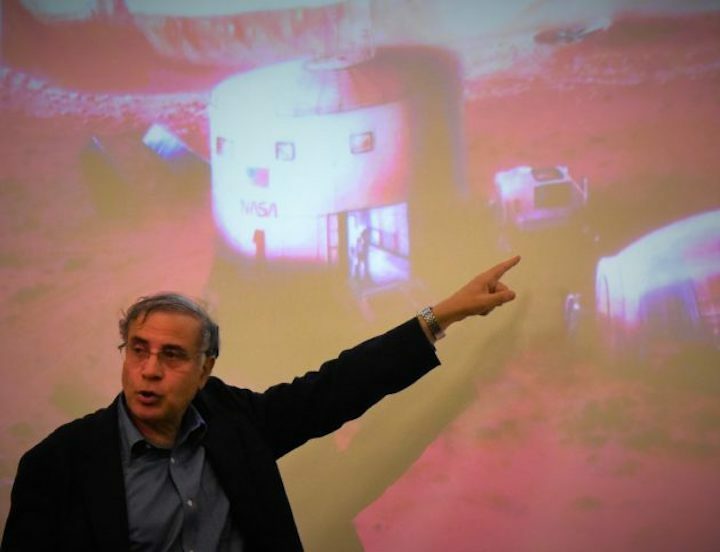 The Mars Direct plan didn’t get much traction, and Zubrin says that’s NASA’s fault. “The manned space science program has been adrift in this period,” he said during a Friday night presentation at the University of Washington. Now NASA is turning its attention to missions to the moon — but Zubrin is worried that, once again, NASA is taking the wrong approach. “They have a ridiculous program right now called the Deep Space Tollbooth … er, Gateway,” he said. The Deep Space Gateway, also known as the Lunar Orbital Platform-Gateway or just the Gateway, is supposed to take shape in the mid-2020s in lunar orbit. It would serve as a platform for trips to the moon’s surface and onward to Mars. Zubrin, however, said the Gateway is an unnecessary stopping point on the way to lunar settlement. “If you want to go to the moon, go to the moon,” he said. He’s not alone in that view: During testimony to the National Space Council in June, retired astronaut Terry Virts made a similar argument against NASA’s plan. “Gateway will only slow us down, taking time and precious dollars away from the goal of returning to the lunar surface and eventually flying to Mars.” he said. The Moon Direct plan calls for using existing launch vehicles — specifically, SpaceX’s Falcon 9 and Falcon Heavy rockets — to help send equipment and eventually people directly to the lunar surface. Uncrewed cargo missions could make use of the Falcon Heavy, while crewed missions would start with a Falcon 9 launch to the International Space Station or some other yet-to-be-built outpost in low Earth orbit. The plan requires at least one puzzle piece that’s still missing: a Lunar Excursion Vehicle, or LEV, capable of landing two tons of payload onto the lunar surface. The LEV is what astronauts would ride from the Earth-orbiting platform to the lunar surface, and if the right infrastructure is in place, it could be refueled on the moon for making the return trip or traveling between sites on the moon. Zubrin estimates the cost of the initial missions to get things started at $1.5 billion, followed by a yearly cost of $420 million to keep things going. “The point is, the heavy-lift vehicles are only needed in the initial stages,” he said. That compares favorably with the outlook for NASA’s heavy-lift Space Launch System rocket, which isn’t expected to start flying until 2020 at the earliest and may cost $1.5 billion or more per liftoff. If moon missions can truly be done at lower cost, that would leave more money (and more willingness on the part of policymakers) to push onward to Mars. “The moon program does not have to be a tar baby that prevents you from doing anything else,” Zubrin said. There’s a chance that Zubrin’s campaign for Moon Direct will make him, once again, a voice crying in the wilderness. But there’s an added reason for hope that didn’t exist in the 1990s. The gap in human spaceflight has “created an opening for the entrepreneurial space companies,” including SpaceX as well as Amazon founder Jeff Bezos’ Blue Origin space venture, Zubrin said. SpaceX founder Elon Musk has talked about using his company’s yet-to-be-built Big Falcon Rocket, or BFR, to support the development of a “Moonbase Alpha” as well as a city on Mars. “We should have a lunar base by now. What the hell is going on?” Musk said last year at a space conference in Australia. Bezos has a similar vision for a city on the moon, facilitated by Blue Origin’s yet-to-be-built New Glenn and New Armstrong rockets plus its Blue Moon lander. “Today, we must go back to the moon, and this time to stay,” Bezos told me at a Los Angeles space conference in May. For now, those two billionaires are banking on their own plans for putting a permanent human presence on the moon and eventually on Mars. But if their plans somehow get stymied, it’s nice to know that Zubrin has a Plan B.